An A-frame sign draws attention to your business from a distance! You can get those important clients to come and say hello, or even better… buy something. Our silver A-frames are made of aluminium and steel with PVC transparent anti-glare covers for your two graphics, which are included in the price. They fold away for easy storage and the snap frame means easy graphics changes. Please note that the sizes stated are for the visible graphics. All frames are supplied with two 220micron PVC posters as standard. Quoted price will include design and delivery. The smallest A-Frame sign is still big enough to grab attention and very popular due to its compact size for easy storage and setup. If you’re just starting out in A-Frames, this is probably a safe bet. The medium-sized A1 A-Frame sign is big enough to grab attention in almost any situation. In fact, it can be hard to miss. This is popular when it needs to stand out from other competing A-Frames. 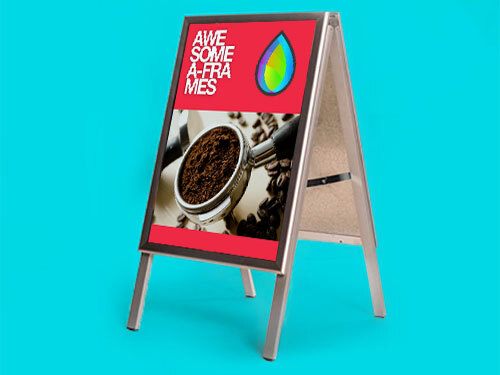 The biggest A-Frame sign that we stock is the A0 Goliath! It is big enough to grab attention in any situation. Some say it is so big it can be seen from space, but this isn’t true – it is still very big though! This is a popular item when you need your marketing material to stand out from the crowd. There isn’t a better attention grabber when it comes to A-frames than this! If you would like us to design the A-Frame for you then please get in touch. However, if you are going to design the sign yourself, we have put together some helpful information for you. These include templates and design guides. If you need more information about any of these, then you can check out guide to bleed and trim marks or the print-ready artwork guide. If you would like us to design the artwork for you, just check that button and tell us a bit about you, what the poster is advertising and any information you think will help us.